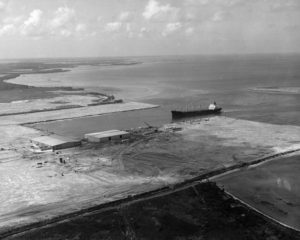 In 1965, Manatee County bought 357 acres to launch a Barge Port and Industrial Port which was eventually named Port Manatee. That same year, the Florida legislature created the Manatee County Port Authority. Port Manatee’s official dedication ceremony took place in October 1970. Community leaders looked south from the Piney Point ferry landing in the early 1950s and envisioned a thriving seaport to promote trade and commerce, provide a steady tax base for the community and create new jobs in Manatee County. Manatee County purchased 357 acres near Piney Point for $900 an acre to launch the Barge Port and Industrial Port, later renamed Port Manatee. Florida Legislature passes the Manatee County Port Authority Act, officially creating the port and its oversight board. The M/V Fermland was the first ship to dock at Port Manatee. Port Manatee primarily served the petroleum and phosphate industries. Petroleum tank farms and fertilizer warehouses dotted the landscape where little else existed. Port Manatee hosts the largest ship to ever call on Tampa Bay at the time, the 732-foot Zenkoren Maru No. 5 carrying 12,000 tons of potash. Refined petroleum and phosphates are the port’s major commodities. Scrap metal, waste paper and plywood also play key roles in the port’s development. Eastern Portland Cement Company, owner of four 170-foot silos, begins importing cement at Port Manatee. Berth 12 provided key services for the reconstruction of the Sunshine Skyway Bridge. Fresh Del Monte Produce begins operations at the port. The Port Manatee terminal becomes its second largest U.S. facility. Port Manatee awarded Foreign Trade Zone No. 169. Warehouse 6 was built for Del Monte’s facility. David L. McDonald PPM® named port director. Regal Cruises sailed from the cruise terminal at Berth 9. Construction began on the Gulfstream Natural Gas system pipeline, bringing natural gas through Port Manatee. Internationally recognized seagrass transplant project began, resulting in 25 acres of new seagrass meadows in Tampa Bay. Manbirtee Key transformed into a bird refuge in partnership with Gulfstream Natural Gas System and Audubon of Florida. The 174,000 square-foot Warehouse 11, Port Manatee’s largest warehouse completed. Gottwald HMK 6407 Mobile Harbor Container Crane made its first pick, opening the door to a new era of container shipping at Port Manatee. Port Manatee signs strategic alliance with the Panama Canal becoming the 10th U.S. port to sign a Memorandum of Understanding with the Panama Canal Authority. The Manatee County Port Authority approves the first phase of the port’s $750 million master plan. The plan calls for a dedicated container terminal on the port’s south side adjacent to the expanded 1,584-foot Berth 12, a second mobile harbor container crane, new cold storage facilities, berth upgrades, land acquisitions and permits for a new container terminal on the port’s north side. 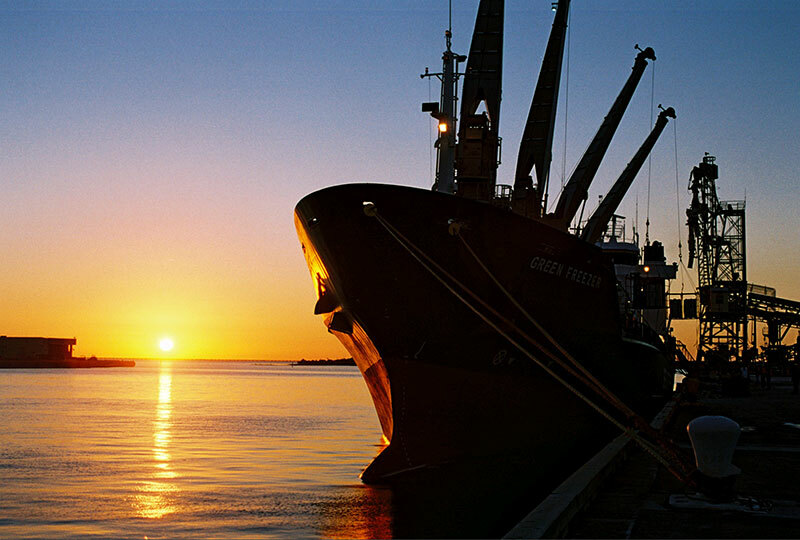 The Port Manatee Encouragement Zone is established to attract major shippers and to entice the relocation of distribution facilities and support industries to a vast green field area neighboring the port. Carlos Buqueras named Port Manatee executive director. Port Manatee finished construction of the initial 10 acres of the first phase of the South Port Intermodal Terminal, a planned 52-acre containerized cargo and vehicle-handling facility. Also completed is the development of the 40-foot-draft Berth 14, which, combined with the adjacent Berth 12, provides 1600 feet of contiguous berthing area. Port Manatee adds more than $2.3 billion annually in regional economic impact and supports more than 24,000 jobs.